Relix is awaiting Riku at the Castle Door. "He better come." (mysterious voice) "He'll come don't worry. He's evil but not stupid." (Relix)" He's not stupid, just not sure. But yeah...he'll come." "Relix? What are you doing here?" Riku walks in with his Organization robe thinking it was a trap. "I've been asked to determine where you stand by a friends of yours." Relix then pulls out a card and toses it to Riku. "Go in and see where you stand." Relix then fades. Riku looks at the Destiny Islands card. "Is this the island that Sora, Kairi and I went to so much?" Riku walked up to a door that had just appeared and held up the card. "I wonder..." Riku closed his eyes. "...If this takes me there?" 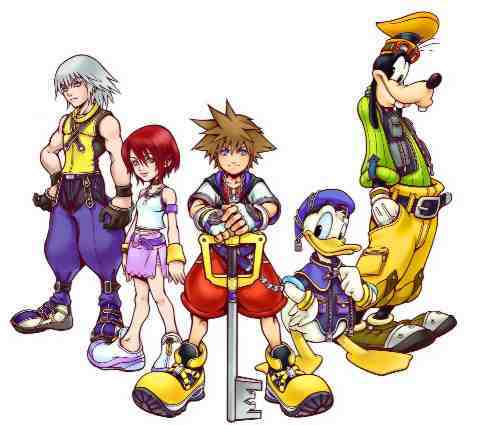 Riku gets teleported to Destiny Islands and sees what appears to be Kaira and Sora. "SORA!!! KAIRI!!!" Riku had not seen either Sora or Kairi for a while. "Wait a minute..." Riku squints his eyes noticing that he could see the horizen through them. "They aren't my friends!!" He looks all around. "RELIX!!! Relix where are you?!?" Relix appears out of thin air. "You called?" Riku lunges at Relix with his keyblade. "WHAT HAVE YOU DONE TO THE ISLAND???" Riku puts his keyblade to Relix's throat. "TELL ME!!" Relix goes through Riku as if he were a halogram. "I didn't do anything. This is out of your memory not mine." Relix looks out the sea and takes out Way To Dawn. "I lived here too and from my memory it looked a lot more peaceful...don't you think?" Relix then charges for Riku. Riku lets his keyblade fall and he takes the blow, he then flys back and hits the wall. Riku sits there and stares at the sand. "It hurt doesn't it? Seeing your home, your, friends, and your memories...fade away to darkness. And do you know who brought that darkness Riku?" Relix says withdrawing his keyblade. Riku looks at Relix. "Sh-shut up..." Riku looks away. "You don't understand...why I did it..."
"Try me. Your not the only one who lost ther home. You should give us an explanation for why you did what you did." Riku shakes his head and turns around looking for the door that had recently dissappeared. "Where did the door go? I want out Relix...LET ME OUT!!!" "So that's it Riku? Your just going to run away and give up? I exspected more from you." "SHUT UP!!!" Riku charges at Relix noticing that he doesn't have his keyblade. He stops. "You're right...I'm a failure as a keyblade master...." Riku drops to his knees and puts his head down. "Riku no. You didn't fail as a keyblade master. You faile as yourself. You doubt the good inside. intill you cling to that light and control your lingering darkness. then you may leave." Relix then walks away through a new opened door. Two doors then appear out of thin air. "One of these leaves the castle the other to another world ...you decide." Relix then leaves throgh the door and it disappears leaving the others for Riku. "Do I...know you?" Sora looks at Riku confused. "Sora...you mean...my friends won't remember me? Never mind...I'm sorry for interupting Sora..."
Riku walks out of the Study. "Relix? Could you help me? What just happened?" "I'm afraid Relix is busy right now...but I'll be happy to assist you." Zexion then appears out of the shadows giving a mocking smirk at Riku. "The Sora you knew is also the Sora YOU threw away for darkness. You and darkness belong togother. Open your heart to darkness Riku. Then you can leave the castle." "...Relix says light...Zexion sais dark..." Riku stands confused. "Why can't this ever be easy..."
"I'll make it easy for you. By eleminating YOU!" Riku shakes his head. "I'm not going to fight anyone...I'm through...I'm sick of it..." Riku puts his head down and closes his eyes. He glows and he throws his keyblade next to Zexion. "I'm done...with being a keyblader...I don't care what happens to me now...kill me...torture me...whatever...Relix was right...I doubt the good inside me...I just........don't know........"
"No Riku you can't give up. Find the light in you and you can overcome the darkness." (said a voice) Relix appears and slashes at Zexion. "So you are in the castle too. Zexion give up you can't win." "Not with us around here to protect Riku both light-" "-AND Darkness. Your Magesty revive Riku. I'll take care of Zexion." Riku is suddenly right next to Relix. His keyblade in his hands. "I must be a great actor...because that was my dummie keyblade..." Riku grins at Relix. "You didn't really think I would give up did you? Look my dummie keyblade is right next Zexion now..."
Riku ran to Serenity and picked her up. "Serenity! Are you ok?"